A recent survey of B2B customers by RainToday had some interesting findings about the importance of different elements in a B2B marketer's online presence. The chart above, posted by HubSpot, outlines the top 10 important factors. 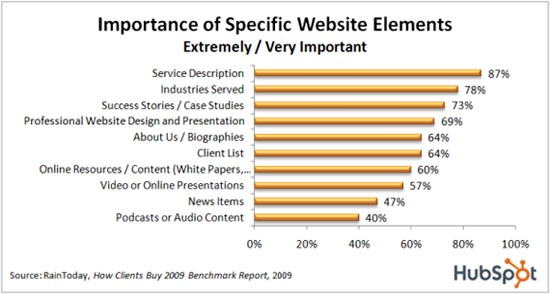 The new study gives credence to philosophies that web designers and marketers have been espousing to B2B firms for years. For example, when B2B marketers approach us about our services, we frequently hear “our customers don’t care about design – they come here for facts and to find our phone number.” It’s a statement that I’ve repeatedly heard over the years. Even if they don't explicitly state it, it's implicitly evident in the way they treat the design process or creative costs. While I'm the first to admit that content is an essential, and likely the most important, aspect of a company's web presence, it's also critical to understand the importance of design. In fact, design is inherently relevant for the rest of the surveyed website elements, as it is the design that will highlight things like white papers, presentations, case studies, etc. Without a well-thought-out layout and attractive design, these other important features will be hidden or cumbersome to the user. A couple of our B2B clients that have really taken this study to heart are Health Decisions and CloudSwitch. Both of these companies have similar targets of highly technical and sophisticated executives. They not only do a wonderful job of creating voluminous content in different formats, they both also placed a high priority on design, making sure their site resisted the template look of many B2B sites. From our initial discussions, both clients were clear that they wanted their web design to be a distinguisher from their competitors, and that they wanted to make their content and calls to action available in an attractive and informed manner. The strategy has worked. Both companies frequently receive compliments on their sites and online marketing efforts, confirming that prospects are noticing. As B2B marketers prepare to embark on a redesign, they will be well served to not only create good content and use inbound marketing, but to also place a priority on good design and informed layout. Are you a B2B marketer that has placed an emphasis on design as well as content? What has the result been? Look forward to hearing other opinions and cases. Interesting. I'm surprised by the result for video. I expected video to be a more importent element. I completely agree, dont confuse activity with productivity. Too often people are preaching Join the Conversation and to get in there and Participate. But participation doesnt equal marketing. Participation by itself will not accomplish any marketing objectives. I think the key is to participate in a way that helps consumers move along the so called sales funnel. People have gotten so overwhelmed with the Cool factor that they forget and confuse activity with productivity and never generate a lead. The other day, I was discussing (http://www.newmediacampaigns.com/page/good-web-design-in-b2b-online-marketing)with my colleagues and they suggested I submit an article of my own. Your site is just perfect for what I have written!